Transfer-pricing is the new word for money laundering. 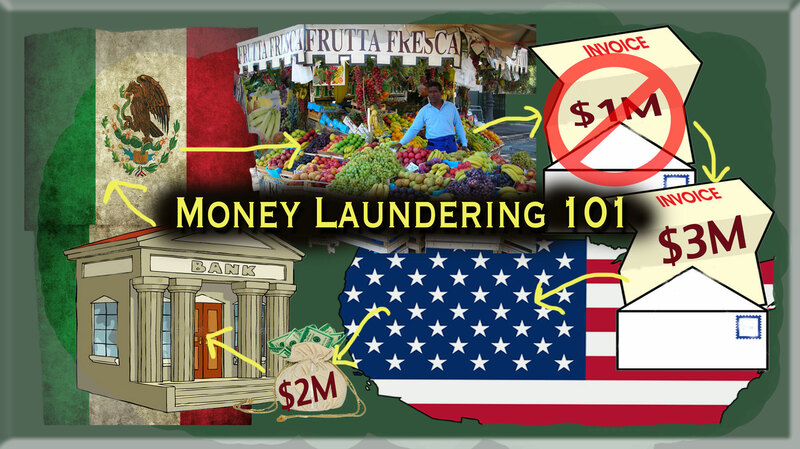 The Treasury department says trade-based money laundering is the new frontier in international money laundering. What is surprising, is how easy it is. Here is how it is done. To get money into a country (such as Mexico at the behest of drug lords), you simply undervalue imports and overvalue exports. The way to do this is through the use of a ‘re-invoicing firm.’ First you create a shell corporation in a tax haven country with strict secrecy rules (Luxembourg, Andorra, Singapore and formerly Switzerland). Second, you hire an off-shore re-invoicing firm (such as AA-Panama). The front company for a drug lord might sell $1 million of oranges to an American importer while the re-invoicing company creates paperwork for $3 million worth of oranges effectively repatriating $2 million back into the Mexican banking system. Recently, one group of launderers was caught exporting from the Czech Republic to America plastic buckets that cost $970 each. Another interesting use of the technique is by Iran to circumvent sanctions. Food and medicine are not restricted under U.S. sanctions so a Turkish front company sells sugar to Iran through a Dubai money-exchanger at $240 per pound giving Iran the hard currency (money such as USD that can be used anywhere in the world) that sanctions specifically proscribe. Re-invoicing firms are teams of tax attorneys who insist ‘tax-arbitrage’ is legal and it essentially is because countries that are tax havens typically have little to their economy in terms of natural resources or exports and therefore cannot afford to apply stringent tax reform allowing and even encouraging graft.